How does the performance depend on the number of turns in the coil? The timing is entirely controlled by the inductance and capacitance. The coil should be wound with taps at various layers, so you can choose the number of turns and therefore the inductance. This is crucial to the success of the Mark II coilgun! The graph at right shows the exit speed according to the number of layers I used, when fired with external iron at 23 volts. My coil brought out a tap at every other layer. Tuning the coilgun involved connecting the SCR to various taps and firing it. Too much inductance means the magnetic field stays "on" too long, and the projectile is held in the middle of the coil. Too little inductance means the magnetism is "on" too short, and the projectile may barely move. Note that a coil's inductance is proportional to the square of the number of turns. This coil had fourteen layers, but the best results with external iron occurred using only the first two layers. (If I had known that, I could have saved a lot of winding!) Later when I removed all the iron, the best results occurred using only the first four layers. My next coil should be designed with lower inductance, and have more taps for more choices, especially at the lower end. From the graph above on the left edge, you can see that even better performance might be achieved with less than two layers. Also be careful to keep lead lengths short. 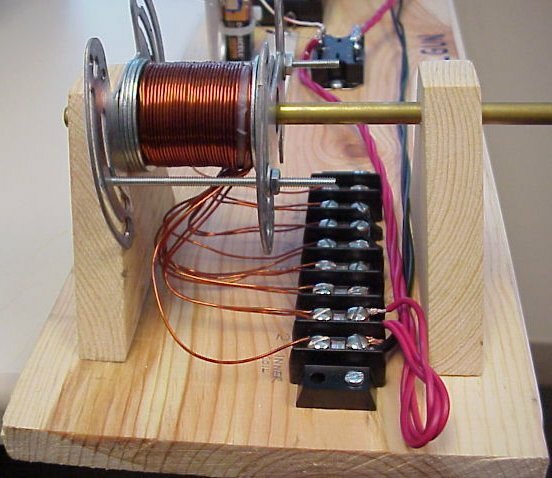 The long wires add both resistance and inductance. Every milliohm and millihenry detract from the exit speed. If I built this again, I would make the loop taps only an inch long and solder the connection for each test.